The flyers were distributed by the Danes' Party (Danskernes Parti) in Brøndby Strand, a Copenhagen suburb where 60 percent of residents are immigrants or Danes with immigrant parents. The brochures were made to look like one-way airline tickets out of Denmark. "To the strangers/foreigners in Brøndby Strand, with love [from the] Danes’ Party," the mock tickets read. 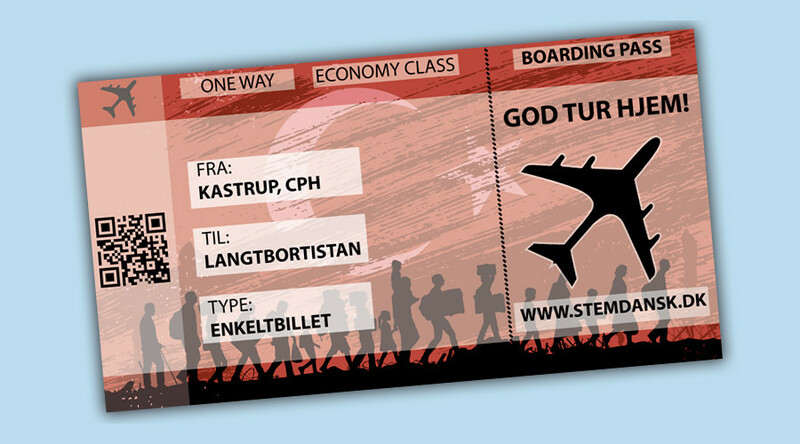 The "airline tickets home" show a flight from Copenhagen Airport to "Langtbortistan," which roughly translates to "Far-away-istan." They also included Arabic text which reads: "Have a good trip home." Residents with last names which do not sound traditionally Danish received the brochures in their post boxes, according to the Local. Meanwhile, those with Danish surnames received a fake check for 16 billion kroner (US$2.28 billion), which is what the far-right party claims the country would save by expelling all non-Western residents. The false checks were made out to "The Danes in Brøndby Strand," and came with a note which said the party is "giving you Denmark back." Brøndby Strand resident Louise Vinther Alis, who is married to a Dane of Turkish descent, told the Local that the flyers have made her feel scared. “I don’t understand how this can be legal. I don’t understand how someone can threaten peaceful residents in their own mailboxes. And yes, I feel like my legal rights are threatened. Like my husband and my children’s rights are threatened,” she continued. Copenhagen Vestegn Police confirmed to Politiken newspaper on Wednesday that a complaint has been filed over the flyers. “Now we will determine whether this is punishable by law and that is something we will do just as soon as we have the necessary legal assistance in here,” police spokesman Kim Madsen said. Residents of the area have planned a demonstration for Saturday, in response to the flyers and a recent statement by the party which expressed "concern" that there are areas of Denmark where the "number of immigrants from non-Western countries and their descendants is over 50 percent." Organizers of the demonstration say the rally is aimed at those "who can't see what's good about Brøndby Strand but only what’s bad." “We’ve had enough. Now we need to stand together, regardless of color and faith,” the organizers wrote on the event’s Facebook page. It's not the first time the Danes' Party has targeted immigrants. In September, it distributed "anti-refugee" spray in a southern town. In March, it was criticized for bus ads which showed white silhouettes playing alongside the slogan "Your children deserve a Danish Denmark." Denmark registered 21,000 asylum applications in 2015, which made it one of the main EU destinations for refugees per capita, behind only Finland, Austria, Germany, and Sweden.